A gem of London’s charming downtown, St. Ermin’s Hotel rests peacefully surrounded by the city’s most entrancing sights, with a beautiful courtyard garden awaiting to welcome travelers in. Nestled in a quiet hideaway among Westminster's vibrant streets, just steps away from the serene St. James’s Park, this London hotel boasts a peaceful setting while remaining a convenient starting point to explore the capital city's most popular attractions. Boasting attentive four-star service, the St. Ermin’s staff will meet guests’ every need, as they can delight in the Art Nouveau, Victorian, and Rococo design influences surrounding them. Guests can select from a thoughtful assortment of dining experiences, including the treasured British tradition of Afternoon Tea and refined, culinary creations of Adam Handling at Caxton Grill. 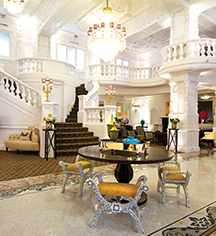 Affording 331 elegantly-appointed guest rooms, 15 versatile meeting and event venues, and unparalleled hospitality, the historic St. Ermin's Hotel has been a quaint visiting ground for numerous guests, along with notable world leaders and distinguished members of Parliament. 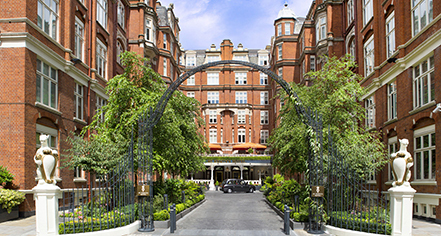 St. Ermin's Hotel, a member of Historic Hotels Worldwide since 2015, dates back to 1889. Winston Churchill held a 1940 meeting at St. Ermin's Hotel to form the SOE, or Special Operations Collective, to enact military strategies during World War II. Cancellation Policy: Varies by room type. Parking: Valet parking: Available; GBP 55 per night. Pet Policy: Service animals allowed: Yes. Pets allowed: Yes. Amenities: Bed and Bowls. Restrictions: Dog Friendly. Maximum size: Small/Medium. Fees:£60 per stay (up to 7 nights). Dog Ambassador: Pearl. A gem of London’s charming downtown, St. Ermin’s Hotel rests peacefully surrounded by the city’s most entrancing sights, with a beautiful courtyard garden awaiting to welcome travelers in. Nestled in a quiet hideaway among Westminster's vibrant streets, just steps away from the serene St. Learn more about the History of St. Ermin's Hotel .